Product Line Engineering Ecosystem & Bridge Integrations | BigLever Software, Inc. Consistent, compatible, unified PLE solutions. The Product Line Engineering (PLE) Ecosystem is an open community of world-class tool providers – including developers of commercial, open source, customized, integrated or proprietary Application Lifecycle Management (ALM) and Product Lifecycle Management (PLM) tools – established for the benefit of engineering organizations seeking consistent, compatible, fully unified PLE solutions. PLE Bridge integration solutions for engineering tools and environments across the full lifecycle. The PLE Ecosystem comprises Bridge solutions that integrate third party and proprietary tools with BigLever’s industry-standard Gears PLE Lifecycle Framework to support seamless PLE across the full lifecycle. The current Ecosystem of BigLever PLE Bridges includes integrations with Aras, PTC, IBM Rational, No Magic, Sparx Systems, Madcap Software, Perforce, Microsoft and Open Source. The Ecosystem continues to grow as BigLever, our partners, and customers add new integrations and strengthen the capabilities of existing ones. BigLever Bridges utilize Gears concepts and constructs to extend third party tools and ensure consistent PLE capabilities directly from the Gears PLE Lifecycle Framework. 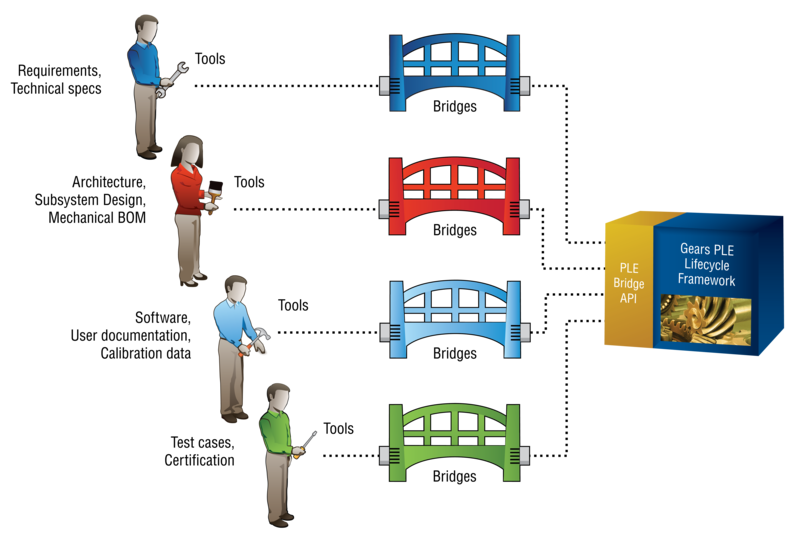 Built on the PLE Bridge API, the following Bridge solutions make third party tools “product line aware” by incorporating standardized variation point mechanisms and enabling the execution of PLE operations – such as product configuration, variation point editing and variation impact analysis – from within third party tools. Bridges for Integrated Development Environments (IDE): Enables developers to access and utilize the Gears Framework directly from the IDE user interfaces and menus. Bridges for Requirements Engineering: Enables product line diversity to be encapsulated by converting requirements into Gears variation points. Requirements can be automatically configured based on Gears feature profiles, in synchrony with other assets across all lifecycle stages. Gears provides built-in capabilities for managing product line requirements using Microsoft Excel and Word. Bridges for Product Lifecycle Management (PLM): Enables engineering organizations to utilize bill of materials (BOMs) as first-class engineering assets in the Gears PLE lifecycle, and Gears PLE constructs as first-class mechanisms for managing product line diversity in BOMs. Bridges for Model Based Systems and Software Engineering (MBE): Enables the management of product line diversity in a single, consolidated MBE model. Model behaviors for different products can be automatically configured by making feature choices in a Gears feature profile. Provides PLE extensions for SysML and UML. Bridges for Quality Management and Testing: Allows test case diversity to be defined based on product line features and test plans to be managed as product line assets in the development lifecycle. Gears provides built-in capabilities for open source unit testing frameworks, such as JUnit, NUnit, AUnit and CppUnit. Bridge Connectors for Configuration Management (CM): Utilizes BigLever’s Gears Universal Configuration Management Bridge™ to enable seamless integration of time-based CM and feature-based variation management for product assets in the Gears Framework. Enables the automated execution of CM operations as the product line evolves. Build Management: Gears enables build management using such build tools as Make, gmake, nmake, ANT, Maven, MSBuild and Build Forge. Bridges for Document Engineering: Enables PLE mechanisms to be used to manage document diversity across the lifecycle and for an entire product line. Documents for individual products can be automatically configured based on Gears feature profiles, in synchrony with other assets in all lifecycle stages. Word Processing, Slideshow and Spreadsheet Development: Gears capabilities are also provided for the efficient management of product line variations in Word, PowerPoint and Excel documents by automatically producing different flavors of data worksheets, user guides and manuals, presentations, legal documents and contracts, instructions to distributers, and so forth.